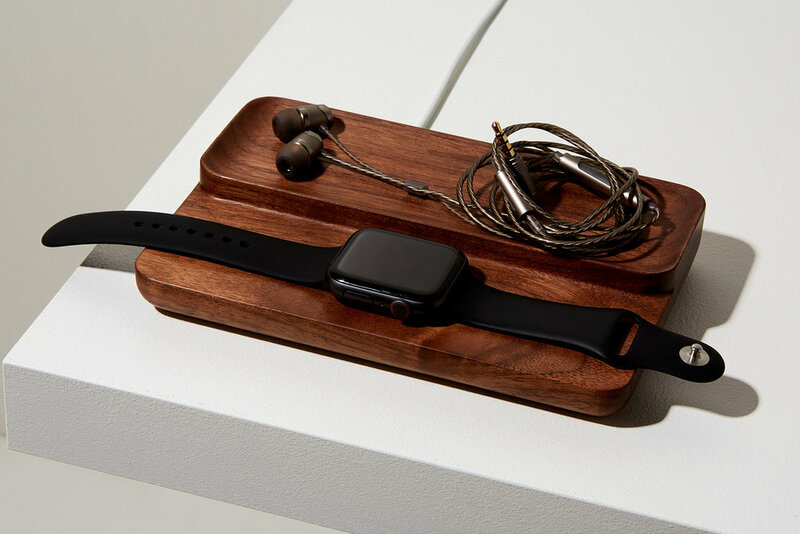 Designed to give Apple Watch users somewhere a little more sophisticated to charge their watch, while keeping your everyday carry neat and tidy, the ANDEN Valet Model II* is as elegantly proportioned as the original Valet, with the tight, consistent curves echoing the contours of the watch. Made to order in London and finished by hand using the finest natural oils, choose from sustainably sourced solid walnut, maple and cherry wood. Please note, the charger isn't included, simply push your existing charger into the precision cut opening and trace the cable neatly through the groove on the base. A deceptively simple design that’s a pleasure to use, the impeccably smooth finish - achieved through the use of five different sanding processes - brings out the natural quality of each material, while the beautifully contoured tray gives just enough space to keep your keys, change, headphones, glasses...whatever’s in your pockets effortlessly tidy.